William Rowell and his brother Samuel Duncan Rowell were both my 3rd Great Grandfathers. Their children, Viola and Enoch, married, and I am descended through their daughter Jennie Clover. It is illegal today for first cousins to marry, but apparently it was still acceptable in those days. 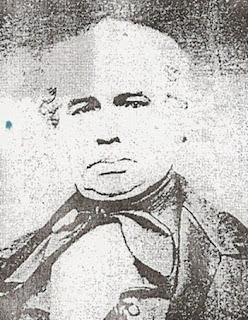 William was born on 23 January 1789 in Candia, New Hampshire, the sixth child of Enoch and Rachel Worthen Rowell. By 1790 Enoch had moved the family to Grantham, NH and then on to Plainfield where Enoch and Rachel lived for the remainder of their lives. Most of their children would, however, leave for Vermont. In the 1810 census William's brother Enoch is shown living in Irasburg, he had married six years earlier and had started a family. But the census shows three adults over the age of 25. I suspect that one of the adults might have been William. By 1811 William and his brother Enoch were in Albany, then known as Lutterloh. Together they bought two lots of land on a farm previously owned by Silas Downer. They apparently set up a still and made "potato whiskey" to pay for the land. After distilling the specified number of barrels of whiskey, they shut down their still and took up farming. The main crops grown in and around Albany at that time were wheat, corn, hay and sugar maples. There was also quite a bit of sheep raised for wool. Almost all of William's siblings would end up in and around Albany. Page one of the 1830 Albany census starts with William, followed by Enoch. Several names down from them is Converse. Eliphalet is on page three and their brother Daniel is on page 5. Their sister Sarah (Sally) and her husband Hiram Moore were married in Plainfield in 1830 but were in Albany, VT by 1832. Their twin sisters Polly and Mirriam also came to Albany, Mirriam remained single but Mary married, still they were buried together. On 6 March 1817 William married Sarah Sally Leavitt. Sally's parents were originally from New Hampshire but had move shortly after their marriage to Hatley, Quebec, Canada, where she was born. Albany is quite near the Canadian border and there were many cross border marriages. William and Sally had five children, four girls and a boy. By the time of the 1850 census only two girls were living, the rest having died. In fact his only son had died just prior to the census taking. Another death occurred in the family in 1850 which would have an impact of William's family. 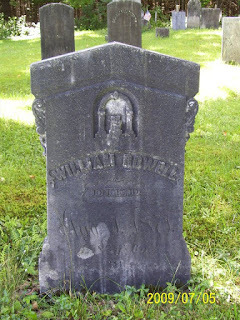 His brother Samuel, who had remained in Plainfield, NH died in July. His wife Polly had died five years earlier, so their younger children were left orphans. His fifteen year old nephew Enoch Converse Rowell came to live with him the following year, 1851. On 24 January 1865 Enoch married William's youngest daughter Viola. In the 1860 census William is the head of the household, living with him and Sally are Viola and Enoch, still single.the land is valued at $4,000. This is significantly more that most of the other local farmers, including his own brothers. In one gazette it said that William had enough cash on hand that he was able to make loans to his neighbors, the article didn't mention whether he charged interest, but I imagine he did. In 1870 Enoch was farming the land valued at $8,000 and he have five domestic servants in the household. By 1870 William was 81 years old. He was probably very content to have his son in law take over the farming and with five servants he and Sally probably had a pretty nice retirement, but that's just my guess. William was a Selectman for the town of Albany for many years, as were his brothers. He was first elected Selectman in 1813. In 1817 he was on a committee that established the school districts of Albany. In 1850 William served as a State Representative for the town of Albany in the Vermont State Legislature, he had previously been appointed in 1820. 1821 and 1842. In 1837 the majority of Sally Leavitt Rowell's family left Canada and headed west to join up with other converts to the Mormon religion. This must have been difficult for Sally as she would never see any of these brothers and sisters again. Her mother, Sarah Shannon Leavitt, also joined in this journey, by 1840 three of her brothers were dead as was her mother. We have no way of knowing what William and Sally thought of the new religion, if they were tempted to join in with the rest of Sally's family or not. Sally became a member of the Congregational church in 1840 and her daughter and grandson were members of Congregational churches as well. William died in 1781 at the ripe old age of 82, Sally passed away two years later in 1873 at age 76. They were survived by two daughters; Sarah Jane Simpson and Viola Rowell.